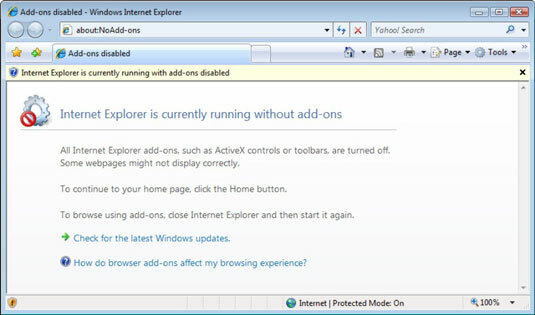 Many Internet Explorer problems are caused by add-ons. Unfortunately, removing unwanted add-ons from Internet Explorer can take some work. This is particularly true of the add-ons that you didn’t invite. Unlike the add-ons that you might choose to simplify your life or improve your media viewing, unwanted add-ons (those rogue programs that attach themselves to Internet Explorer when you load a piece of shareware or unsuspectingly visit the wrong Web site) are designed to keep tabs on you. They report back to their parent programs the kinds of things you like to buy or sites you like to visit. Internet Explorer traps many — but not all! — attempts by rogue IE add-ons to go behind your back and connect directly to the Internet. For example, if you install Yahoo! 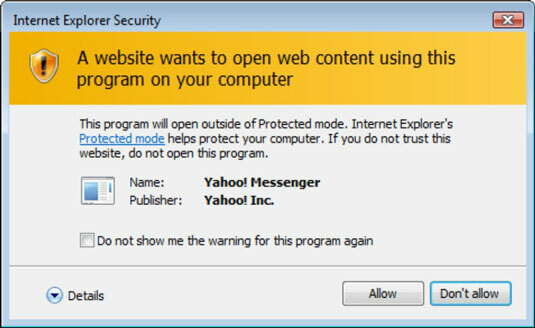 Messenger and then open Internet Explorer, you may see the following warning dialog box. If you click Don’t Allow, Internet Explorer pauses for a moment and then shows you precisely the same dialog box. Click Don’t Allow (or “X” out of the box) and you get it again. And again. You can’t get past the dialog box, and you can’t “X” out of Internet Explorer while the dialog box is open. You’re stuck between a rock and a hard place. There’s only one way to break out of this loop. Press Ctrl+Alt+Del and click Start Task Manager. In Windows Task Manager, click the Applications tab. You see a list of running applications. Select the line for Windows Internet Explorer and click End Task. Vista responds with a scary dialog box that says it cannot end the program because it is waiting for a response from you. Well, DUH! 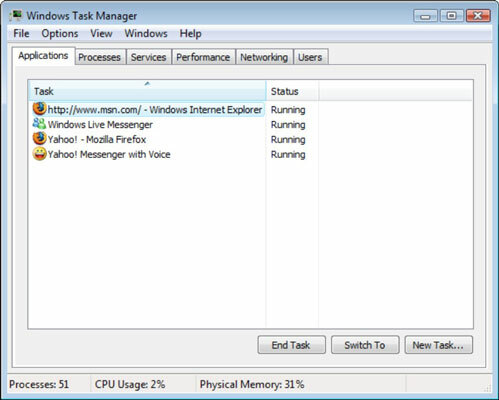 Click End Now to chop the beast off at the knees and then “X” out of the Task Manager. Once again, you see the Allow or Don’t Allow dialog box. This time, the dialog box disappears. System Tools→Internet Explorer (No Add-ons). Internet Explorer starts without running any add-ons, and you see this warning. Start a clean copy of Internet Explorer. Tools→Manage Add-ons→Enable or Disable Add-Ons. 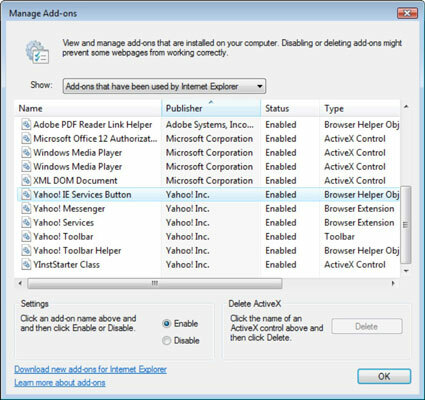 In the box marked Show, choose Add-Ons That Have Been Used by Internet Explorer. Then click the Publisher column head to sort by publisher. When you’ve jumped through all those hoops, you see a sorted list of add-ons in the Manage Add-Ons dialog box. Get rid of offensive add-ons here. One by one, click any suspect add-ons and then click Disable. If you change your mind, you can go back and Enable any unjustly accused add-ons. Even if you can delete an add-on (in particular, you can delete any listed with a Type of ActiveX Control), it’s better to Disable. If you run into something spectacularly unique, the people responsible for tracking down such things might want to be able to see what was there. Click OK three times, “X” out of Internet Explorer, and then start IE normally. The scummy add-on will never darken IE’s door again.